So here I am, 21 years old and certainly not one from the pinball generation. Why do I love pinball so much then? It all began in my childhood when I was fascinated by all moving and turning things. And it might just be true that my pinball dedication was started with that toy maze I got for one of my birthdays, where you had to balance a metal ball through a 3D maze with moving parts. I loved it and only a couple of months or a year later I remember standing in front of the first pinball machine in my life. I must have been seven or eight at that time and we were in a hotel for vacation. If I just knew what the theme or the name of the machine was! I'm not even sure it was one of the famous ones, but anyway, I remem-ber that it had two flippers and bumpers. XD At first I didn't understand how it worked, but later I watched an older girl play and when she pushed the buttons on the cabinet side, it clicked in my head and I thought, "yeah, that's it!" After that I was hooked on pinball. I didn't know what to aim for, I just kept the ball in play as best as I could. I must have played a few machines in my life though the only ones I remember are Star Trek: The Next Generation in a bar on a birthday party, The Machine: Bride of Pin*Bot on 1997's class trip, and Terminator 2 & Dirty Harry around the same time in an amusement park. Of all those, The Machine was the one I played the most and "for real" by the rules. When we got the first personal computer, the first game I bought in my life was Pro Pinball: The Web, an excellent simulation that was brand new at the time. I couldn't stop playing it, found out all the rules myself, learned how a modern pinball game was designed, and wished I would have a real machine someday. 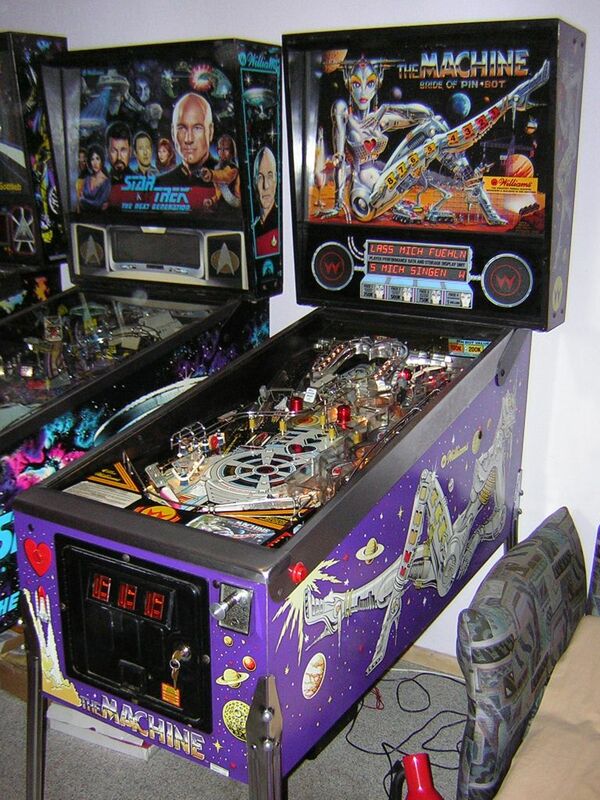 Of course, being inexperienced and living in a time where pinball games were still commercially produced, I thought it would cost thousands to buy one for your home, and so I never got over the edge to make it a real hobby, just a dream from time to time and more and more pinball sims on the computer that I played when I had a "pinball phase". But if someone had stepped up to me in 1997 and told me that "you will have this machine at your home in seven years", I probably would have died from a heart attack (my friends still make this joke on me). But after all, this year (2004) marked the start of pinball as a real hobby of mine, and a quite possible one! My current games are The Machine: Bride of Pin*Bot, Johnny Mnemonic and Space Shuttle. In total, I've had 14 pinball machines in two years and four months. Eleven of those left the building again and moved to new owners. You can see info and photos about all of my machines using the respective links. Why Do You Use Shipping So Often? Well, because I am 21, don't have a car nor the license to drive one, and all cars I would have access to (to be driven by somebody else) are too small. Besides, at the moment the prices for gas have increased so dramatically in Europe that many shippings cost a lot less than picking the machine up yourself. However, there is a certain magic to going out there and making the long way for a personal greeting and packing - it's just that I never did this outside of Berlin. Are You a Pinball Maniac? I am called that by some people on the Internet who also look at this site (hey Mav). However, pinball is the grant of a wish I've had since I was a child. It's one of the very few hobbies that I really care about and where I finish what I start. Pinball is not only about putting your room full of machines and playing them every day. It's about the love for the technology, the themes, the strategy and skill of playing the game and the completely separate field of restoring an old machine so it looks all new and shiny. All of this makes it very serious to me (and so many others), but I've been into computers (gaming, programming, OS, graphics, video editing, audio, everything) since I was eight years old and I also have a passion for anime (Japanese animation) which started in 2001. I am also a drummer and I've played drums for eleven years now, but I quit the long road of learning two years ago and took a break from it for a few months since my schedule no longer allowed it and I had other things which kept me busy. Today I'm playing in a band called Szanaterria and we will be recording our first CD soon.